Emmys 2014: Who's In and Who Got Snubbed? Emmys 2014: Who’s In and Who Got Snubbed? 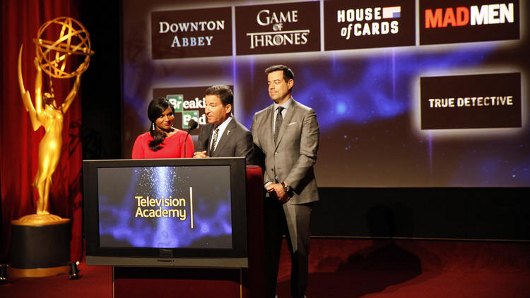 Mindy Kaling and Carson Daly onstage with Television Academy Chairman and CEO Bruce Rosenblum. Photo from the LA Times. Awards season is upon us once more and we kick off this joyous (or upsetting, depending on the results) occasion with the 2014 Emmy Award nominations. HBO’s Game of Thrones led the pack with the most nominations at a whopping 19, including the much-coveted Best Drama Series. The show was followed by newcomer Fargo and American Horror Story: Coven, with 18 and 17 nods respectively. On the comedy front, Netflix’s Orange is the New Black tops the list with 12 Emmy nods. You’ll see some familiar names on the Best Comedy Series, including The Big Bang Theory and Modern Family. Was your favorite nominated? Who do you think is missing on the list? Let us know in the comments! 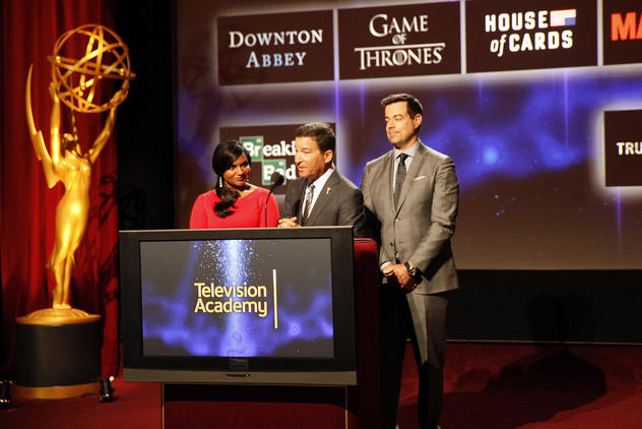 The 66th Primetime Emmy Awards will be held on August 25, hosted by Seth Meyers. For a complete list of nominees, log on to the LA Times.